Mary Lisa Kitakis-Spano became an artist in residence at Shands just after the inception of the Arts in Medicine program in 1990. As the Visual Arts coordinator, she purchases materials and oversees visual artists and volunteers who bring the creative arts to patients, families and staff through painting, drawing, collage, ceramics and crafts. Mary Lisa also works with pediatrics for the annual Children’s Miracle Network arts auction and organizes the event along with other Arts in Medicine team members and volunteers. 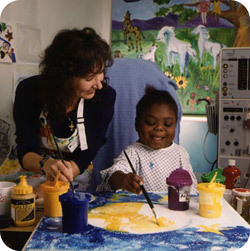 Mary Lisa’s original artwork is featured throughout the hospital. Her mosaics are displayed at the entrance to the Emergency Room in the Cancer Hospital and on pediatric levels three, four and ten in Shands Hospital’s North Tower. She is currently at work on a large-scale mosaic that will welcome patients from around the world to the Gainesville community. The piece will be installed in the North Tower outside the 4th floor atrium elevators. It will depict Florida—from its Gulf coast to its east coast shores—incorporating maps, compasses, wetlands, horse farms, orange groves, springs, oceans, and beaches.